A little French girl. A visit to Grand-mère’s farm. A surprise lesson in sharing. Join Lulu and her family on a springtime trip to her grandparents’ farm. Participate in all the family fun, playing soccer and board games. Tag along with Lulu while she visits the animals, and welcomes a new baby kid. When the weather abruptly changes and the baby goat gets cold, Granf-mère pulls out her knitting needles and gets to work. A surprising request to Lulu involving her favorite ball of yarn provides a vaulable lesson in sharing! 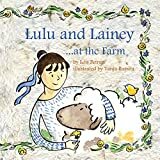 Lulu and Lainey … at the Farm is the fourth book in this picture book series for children 4 – 7 years of age. If you and your children like unique stories with suspense and surprise endings, you’ll love these books. Buy Lulu and Lainey … at the Farm today to find out how Lulu saved the day!